Alex Toth is admired for his work in several different fields: illustration, comic books, and his great design work and storyboarding for animation. Here's a 1970's DC Comics' Superfriends storyboard rendered in conte crayon and marker on an 8 1/2" by 11" animation sheet. It's page 3 for production #128. It features Green Lantern , Batman and Robin , and Wonder Woman! It's in very nice shape, with one small production stain in the lower right hand corner on the word cont. Analyzing "Smart Counters" only at inkFrog. 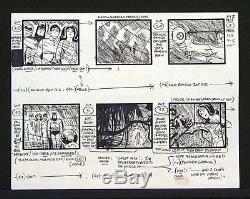 The item "ALEX TOTH SUPERFRIENDS (JLA) STORYBOARD WHOLE CREW" is in sale since Sunday, May 24, 2009. This item is in the category "Collectibles\Comics\Original Comic Art\Other Original Comic Art". The seller is "kirbyfan44" and is located in Simi Valley, California. This item can be shipped to North, South, or Latin America, all countries in Europe, Japan, Australia.